TAMPA, Fla. -- In the distance, it rises like Africa’s Mount Kilimanjaro. As you approach, it takes on the shape of a dormant volcano. Suddenly, a familiar aroma engulfs your nostrils and stimulates your senses. Standing next to it is quiet surreal; one might even say it’s a metaphysical experience. What is it? 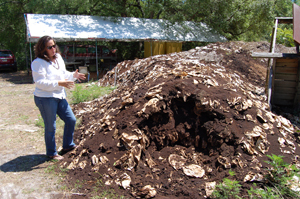 It’s the compost pile at the University of South Florida’s Botanical Gardens--and it’s made entirely out of coffee grounds. Thanks to some creative thinking, what was once someone’s mocha java-chip frappaccino is now the catalyst for growing healthy, hearty, plants and vegetables. About two years ago, HMS Host, the food and beverage service at the Tampa International Airport, contacted Laurie Walker, the director of the USF Botanical Gardens. HMS Host had a unique idea. Every month, the various coffee shops at TIA produced about 5 tons of used coffee grounds that would normally get thrown in the garbage and into the waste stream. Instead, HMS Host said they would gladly give them to the USF Botanical Gardens to use as compost. Walker was delighted with the idea, but had one concern. How was she going to get it? Enter Paul Mitchell, the maintenance engineer for HMS Host at TIA. According to Walker, he personally delivered about 10,000 pounds of grounds each month and emptied the buckets one by one and onto the pile--by hand. And he’s still doing it. “What’s so surprising about that is that the only months he missed was when we threw him for a loop because we were closed for Christmas and New Year’s Eve,” Walker said. As a result of HMS’s generosity and Mitchell’s manpower, the gardens have received more than 57 tons of coffee grounds since the program began in May, 2010. Walker said coffee compost is preferable over animal-dung compost because sometimes animal-dung is from omnivores, and for composting, you should only use dung from herbivores. One might ask if using coffee compost instead of dung compost is worth all of the extra time and labor. It does beg the question: Does it really grow better plants and vegetables? Or does the uniqueness of using compost (that includes coffee grounds from Starbucks) just create an ambience of pleasure, a sort of placebo effect that affects the grower’s perception? Sara Callahan, Ph.D., who teaches Ethics of Food Production at USF, thinks the former. Her class recently attended a special event at the gardens that included a buffet of vegetables they grew themselves. As her students munched away on their freshly picked delights, Callahan explained the secret of their success. Callahan is spot on. And just one glance at the USF Botanical Gardens’ vegetable garden should make a believer out of any skeptic. The USF Botanical Gardens consists of about 16 acres that includes more than 3,000 flowers, plants and vegetables. It is also home to a variety of bee hives that produce some delicious honey which is for sale. It is open daily, however closed for major holidays. For more information, please visit the USF Botanical Gardens’ website.